The protestors – who have held weekly marches opposing the bailout – want help getting a meeting with the ECB. 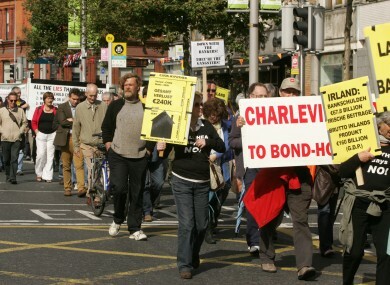 The Ballyhea protestors at a demostration in Dublin last September. Some of the participants have today travelled to Brussels. MEMBERS OF a campaign group that has held weekly marches opposing Ireland’s bailout for almost two years are in Brussels today to meet with MEPs. The protestors from Ballyhea and Charleville in Co Cork are meeting members of the European Parliament’s Economic and Monetary Affairs committee, including its chairwoman, Sharon Bowles from Britain’s Liberal Democrats. The group said the ultimate goal of its travel was to seek assistance in securing a meeting with the European Central Bank, which it holds responsible for pushing Ireland into a sovereign bailout to save its banking sector. Campaign founder Diarmuid O’Flynn told radioep.ie it was his ultimate goal to get a meeting at the Frankfurt-based bank so he could ask it to explain its actions. Members have already travelled to Frankfurt to seek such meetings, but have met with little success. O’Flynn – a sports writer with the Irish Examiner by day – said ultimately it was his hope to speak and negotiate directly with the bank. I would like to somebody in the eye in the ECB, and ask them to justify what they have done to the Irish people. To justify what they have done: all the lies that they told us, all the bullying that went on, all the blackmailing that went on… that unless you accept this bank debt, we’re going to pull the plug on the other funding. I would like to look someone [in the eye] in the ECB – not somebody at the bottom, somebody at the top – to justify what they have done to us. The group is bringing a number of letters, directly addressed to Bowles, written by ordinary people in Ireland outlining how they have been affected by the crash and by the austerity that has followed the bailout. Email “Ballyhea protestors in Brussels to meet MEPs from economics committee”. Feedback on “Ballyhea protestors in Brussels to meet MEPs from economics committee”.